Tag line: "If you go down to the woods today... Watch out for Cropsy!" For those who love trivia, here are a few interesting facts about the 1981 horror film The Burning: not only did it mark the big screen debuts of Holly Hunter (Raising Arizona, The Piano), Jason Alexander (George from Seinfeld) and Fisher Stevens (Short Circuit), but it was written (at least in part) and produced by Bob and Harvey Weinstein, who would go on to found Miramax pictures and, over the course of a few decades, haul in a number of Academy Awards. 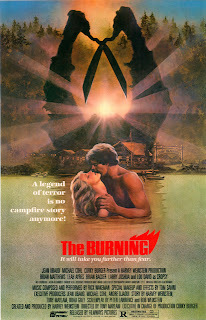 Oh, and The Burning is also one of the best ‘80s slashers out there. Don’t want to forget that! As our story begins, a number of kids at Camp Blackfoot decide they've had enough of the site’s miserable caretaker, Cropsy (Lou David), and play a practical joke on him. Only things go very wrong: when the smoke (literally) clears, Cropsy is lying in a hospital emergency room with burns covering most of his body. Five years pass, and Cropsy, still badly deformed, is finally discharged from the hospital. But he hasn't forgotten what those kids did to him, and, wielding a pair of garden shears, he heads back to Camp Blackfoot to take his revenge on its current crop of youngsters. With its story of a killer stalking young adults at a campsite, The Burning was obviously designed to cash in on the success of 1980’s Friday the 13th. Yet the movie ends up being so much more than a run-of-the-mill rip-off. For one, the opening scene, where we witness first-hand the burning of Cropsy, was executed brilliantly (the sight of Cropsy engulfed in flames is one of the film’s strongest images). Next, the collection of “kids” (most of whom look well over 20, but what are you gonna do?) that Cropsy stalks throughout the picture aren't typical slasher victims. Dave, played by Jason Alexander, is a precursor of Seinfeld’s George Costanza, and steals nearly every scene he’s in. Brain Backer is also solid as Alfred, the awkward camper who spends most of the movie running for his life, and Larry Joshua’s Glazer is the perfect bully, a guy you can’t wait to see get his comeuppance. The Burning has all this, and Tim Savini to boot. An expert at make-up and special effects, Savini rejected an offer to work on Friday the 13th, Part 2 to instead make The Burning, and his handiwork is on full display in the film’s most famous sequence, in which Cropsy attacks five campers as they float down the river on a makeshift raft. Featuring a number of talented performers at the start of their careers, and a make-up artist who was already a master of his craft, The Burning simply had too much going for it to be anything less than an excellent horror film. @beep: LOL. Thanks for the comment. A nice tribute to that lunatic, Cropsey!